Native Instruments just announced the latest update to the Traktor Arsenal bringing Ableton Link support with Remix Deck sequencing in their 2.11 offing. They released a public beta a few weeks back showing off some of these features. Previously step sequencing was only possible using the DJTechTools Midi Fighter controllers that had an internal clock/sequencer on it. The layout of the sequencer seems very cool with possibilities of sequencing upto 16 steps for each of the 4 remix deck parts and also control the sequence length for each part giving way to creating polyrhythms. Easily sync your TRAKTOR setup with your friend’s laptop running TRAKTOR or other Ableton Link enabled software. Play the ultimate back-to-back set, or create your dream performance setup on one or several devices – including iOS.If you’re not yet aware, Link is a tempo-syncing protocol that works between apps on a single device, or across a wireless LAN. 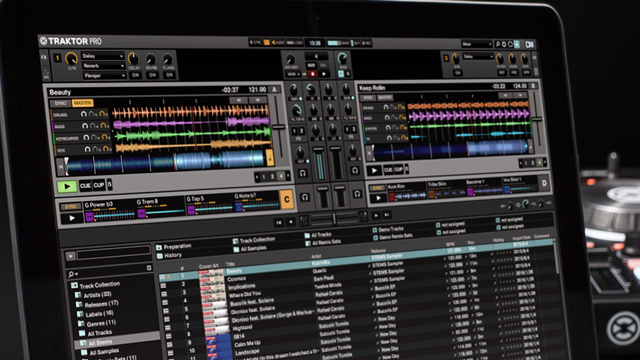 This also opens up Traktor to easy integration with everything else with sync support. Add an iPad drum machine. Drop in loops in Ableton Live. And it seems soon inevitable that we’ll see some additional solutions that allow easy hardware connection or ship with Link support already integrated in hardware. Here’s a list of apps that support Link. TRAKTOR’s integrated Step Sequencer for Remix Decks is here. Create beat patterns on the fly with TRAKTOR KONTROL S8, D2, and F1, or map it to any other MIDI enabled hardware. There’s no user interface within the software right now that allows you to see the step sequencer, it only is visible if you have a controller that is either pre-mapped (see below) or MIDI mapped to the sequencer. However the mapping system is open and can be mapped to any other controllers, devices like the Xone K2 / Traktor F1 are ideal choices for sequencing. Here’s a full list of the sequencer’s features. Pioneer DJ’s CDJ-2000 NXS2 now features HID Integration, plus the Pioneer DJ DJM-900 NXS2 is now Scratch Certified. This caused a bit of an uproar initially with the 900NXS2 buyers pointing fingers at Pioneer, but that is a done deal now!